Story: The fourth of the four Sects from the Cult of Ragnarok, The Fenris Sect believe that the world will end by a devastating winter that will kill all plants and living things, giving those that survive a new, pure world to rebuild. With that ideology, The Fenris Sect dedicates themselves to delivering an extinction event caused by an epic winter. The Fenris Sect go about this by utilizing nuclear devices to awaken inactive volcanoes to coat the sky in ash, blocking out the sun or seeding the sky to cause an eternal winter. For smaller experiments, the Fenris Sect has experimented with using chemical weapons that will flash freeze entire cities. Overseeing special missions for the Fenris Sect is their Avatar, Fenris. Capable of generating ice structures and freezing any who stand in Ragnarok’s way, Fenris eliminates all who dare to delay the End Days. Like its Sect brethren, Fenris’s abilities are thanks in part to possessing Shards of the Philosopher’s Stone, making him an enemy of the Alchemist and to the Agents of John Dee. 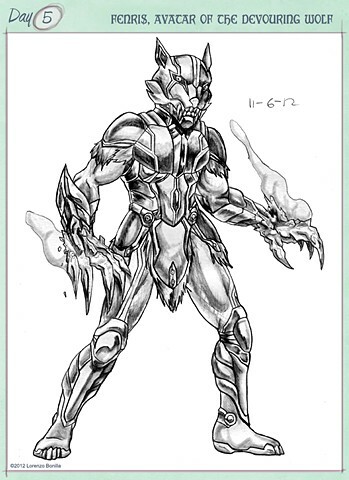 Abilities: With the aid of shards of the Philosopher’s Stone embedded with Fenris’s gauntlets and helmet, Fenris is able to manipulate the air molecules around him by subtracting heat and multiplying the moisture in the air to generate intense cold. This power enables Fenris to create various ice constructs such as Claws, swords, and pillars of ice. The helmet enables Fenris to deliver a vicious breath attack that combines elements of a snowstorm and a sonic boom called the “Howl of Fenris” that simultaneously freezes and sends his targets back within his blast radius. Fenris also possess a freezing touch that will encase his victims in a perpetually frozen state unless he commands it to stop. Fenris is also a superior hand-to-hand combatant that is capable of both close quarters and the weapon arts. Fenris is also shown to demonstrate an understanding of thermondynamics, electrical engineering, and meteorology. Conception: Fenris was my second idea after splintering the Cult of Ragnarok into different sects, but the last character that I got a clear idea on his design. One difficulty I encountered was incorporating fur elements into his suit design and two, the mask. The mask went through multiple revisions until I came up with a design I was satisfied with. For the suit, I utilized elements from the animated Loki and the Executioner from the cartoon, Ultimate Spider-Man while the helmet was a mixture of elements from various sources, like the Wolf Head Gang from the anime Chrome Shelled Regios, fan art on wolf helmets, and my own tweaks. My finishing touch was to make his gloves coated with ice claws as a showcase of Fenris’s abilities.